With over 10 years’ experience Evolved Energy Solutions are one of the country’s leading specialists in thermal imaging surveys. We provide detailed house inspections using thermographic equipment. In an experienced pair of hands a Thermal imaging camera can be a powerful tool, used to pinpoint how and where a house is losing heat in winter months. What will a Thermal Imaging Survey from Evolved Energy Solutions highlight? Missing, damaged or non-performing insulation materials. This is a major contributing factor to uncomfortable, cold homes. Cold Air Leakage, air Infiltration and air Exfiltration is unwanted air movement through a building. 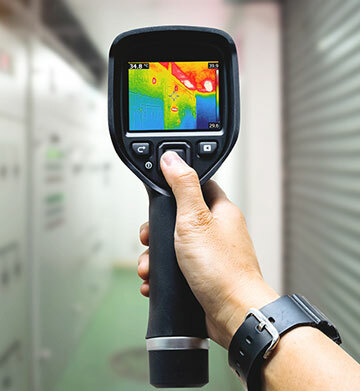 A thermal imaging survey can highlight the route of the problem, which can be as common as a failed weather seal or as complex as an air pathway through plumbing or electrical service installations. The leakage path is often complex and, without infrared, extremely difficult to identify and locate. Moisture instrusion. As building designs and techniques produce tighter thermal envelopes moisture (from leaks or condensation) have created more and more problems. When water enters through a small crack it is then trapped between building materials. Thermography can find traces of water invisible to the human eye. Condensation. This may be a cause of moisture instrustion. It is important to identify sources of air leakage that can transport moist air into the wall sections and cause condensation. Mould Growth and Health Issues. Mould, organic fumes or bacteria plays a significant role in a variety of health issues. Damp surfaces with inadequate air change rates provide the breeding grounds for mould spore to develop and grow. © 2018 Copyright Evolved Energy Solutions. Dublin, Ireland.